Okay, I think I’ve got it. Bear with me because this is a burgeoning idea, and I’m not certain how successful my execution will be. Originally, the foremost point of this blog was to examine “The Plan” and to also depict my many muck-ups while trying to decipher said plan. You know, The Plan, i.e. Great Big, Really Interesting, Totally Cool blueprint that God has designed and predestined for me and over which he has enjoyed many a laugh fest due to my often inaccurate deciphering. Yes, you remembered. After watching The Rachel Zoe Project last night and sensing a strong desire to flip through a Vogue and shout “Bananas!” and “I. Die.” while pointing at ensembles that j’adore, I realized that I would love nothing more than to be a stylist or clothing critic, if you will. (Yes, I realize I possess no true qualifications.) Therefore, in an effort to bring some relevance to this incoherent, mess of a blog, I believe I shall begin to offer my totally unsolicited fashion opinions….because I can…it’s my blog. I think the title of the blog still fits, though. I mean, we all have embarrassing photos that were the shameful results of dubious misadventures in ensemble planning. Ideally, I’d like the entries to bear relevance and daily application for us normal, everyday people, but I don’t think I’ll be able to resist editorial haute couture. Whatever. I’m doing it. It will be what it will be. Maybe it will be interesting. Maybe not. I’m going to shoot for daily entries, but I’m fearful this may be a lofty goal so I’ll go as far as to guarantee weekly entries. In recognition of my latest muse, Ms. Zoe, I believe it necessary to immediately discuss shoes. I realized that she was truly a woman after my own heart as I watched her being spirited across sand by a male assistant due to her refusal to part ways with her gorgeous, 10 mile-high, black boots in order to trek across the beach to a Harper’s Bazaar photo shoot. What God has joined together, let no terrain put asunder. “I don’t even own a pair of flats”, Rachel declared confidently, which immediately brought to mind an article I once read about Victoria Beckham. I already know what you’re thinking. “Oh, Sarabeth, you’re getting way too profound for me, what with all this talk of celebrities like Posh Spice.” Nonetheless, I remember her admitting that, yes, sometimes high heels can hurt. One’s feet do get tired…but…she doesn’t care. She feels more comfortable in heels than in flats. This is a hard concept to relay to those who bemoan any type of foot discomfort as if it were the plague. And, yes, I understand if you don’t want to wear heels, and I also understand if you are legitimately uncomfortable. Don’t wear heels if you don’t want to. Great flats exist in this world. But let the record state that I’ve experienced just as much foot discomfort in flats as I have in heals. All I’m saying is, “Rachel. Victoria. Stacy London. 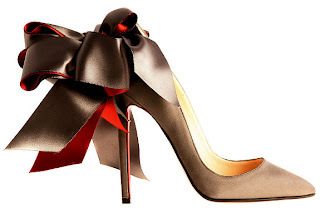 I totally get it.” Let us laud Louboutin and pray that the good Lord allows him many more successful years in making women’s feet prettier one pair at a time. HA HA, well said. Wouldn't we all love Rachel Zoe's life? And her husband! I mean he is so cute. Cuter than her really. And she is pretty darn cute. But, mostly, I just want her body, clothes, shoes, car, and don't forget the driver! OK, so I have fulfilled my quota for being covetous and shallow today. Love ya. I'll say it again: I really enjoy your blog. I felt very connected to Jack Donaghy's girlfriend (Addison? Armistan? AVERY!) when she explained her so-called-by-him "impractical" footwear by saying, "Flats are for quitters." If flats are for quitters, crocs are for people who have quit, gone home, and have decided never again to compete. I went to a board meeting a few weeks ago, and a man was wearing a full suit and tie with crocs. As Rachel would say, I literally died. Love that girl, but she clearly doesn't understand the meaning of the word literally. Keep up the good work, Sarabeth! Crocs with a suit and tie, ay? One of my co-workers sent me a link to one of Crocs' newest release...the high heel crock...it's not good.